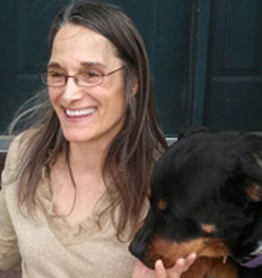 Indian Peaks Veterinary Hospital | Lisa Sabichi, D.V.M. Dr. Sabichi was raised in Colorado. After attending CSU for her undergraduate degree in Microbiology, she graduated with her Doctorate of Veterinary Medicine in 1985. After working for 10 valuable years in other veterinary clinics, in 1995 Dr. Sabichi followed her dream and opened Indian Peaks Veterinary Hospital in Boulder. She loves being a Veterinarian in a small animal general practice where she can get to know her patients and clients. She values being a part of all aspects of her patients’ veterinary care during the span of their lives. Dr. Sabichi enjoys the challenges that both medicine and surgery offer and she appreciates the trust placed in her by her clients and patients to share in the precious human-animal bond. While not at work, Dr. Sabichi enjoys her family and the Colorado outdoors. She loves spending time with her pet family, which currently includes Coco (Rottweiler Labrador Mix, adopted from Longmont Humane Society) and Jade (Rottweiler, adopted from Rottie Rescue). She also has an avid interest in disaster medicine and devotes available time participating in both local and national disaster response teams.